Tulum has one of the most beautiful backdrops of all of the famous Mayan Ruins. It´s location overlooks some of the most breathtaking stretches of the Carribean Sea. It´s views of the Carribean are atop a very large cliff, probably as protection from hurricanes, and storms as well as a viewing deck to watch the horizon for incoming ships and threats. You will want to bring your swim gear on any of our Tulum Ruins tours from Playa Del Carmen as you will have access to swim below the ruins on a private beach that was once used only by the Mayan´s. Tulum was one of the last cities built by the Mayans, which makes this one of the newest of the ancient Ruins. 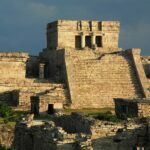 The Tulum Ruins tour is located about an hours drive from Playa Del Carmen, and an hour and a half from Cancun. 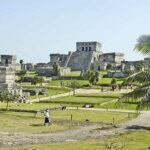 Depending on your tour choice you may choose to only visit Tulum, or you may take an option to add the Coba Ruins tour as well. The choice is always yours. If you choose to also visit Coba you will soon be able to put together the pieces of history as to why the Tulum site was so important. Coba was a much larger city than Tulum, but Tulum played a major importance as a port city that the Mayan´s would use to distribute goods throughout the Mayan world. They would use Canoes, and river systems to bring these goods such as salt, textiles and more inland to trade between cities. 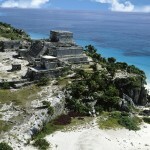 Tulum also had good access to land routes that were used as well to connect the Mayan cities and make trade possible. One of the first things you will notice on your tour of Tulum is the large walls surrounding the ruins. These walls were believed to be put in place to protect the city from attacks from unwanted visitors, or neighboring tribes. When entering the city you will walk through a small rock tunnel. It is interesting to see the height of these tunnels. As we walked through, we would always have to duck our heads. When you do this you realize that the average size of the Mayan people must have been much smaller than the average person today. All of this will be explained in full detail by your personalized guide in English and Spanish on one of tours. 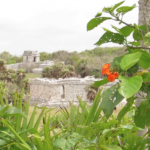 There are three main structures of interest that you will see on your Tulum Ruins tour. Our personal favorite is the Pyramid El Castillo, also referred to as ¨The Castle.¨ This particular building is located overlooking the cliff over top of the Carribean Sea. It is a beautifully constructed building with near perfect symmetry. Located on the top of this pyramid is a small shrine that matches perfectly with a break in the barrier reef. It is theorized that this shrine was used as a guide for incoming canoes to prevent from crashing into the reef. It also has holes in the Carribean side of the building that may have been used for watching canoes come in. Directly below this building at the bottom of the cliff is a perfect location for canoes to come in and out, and is believed to have been used for exactly that. This is also the same beach that will be able to swim at during your tour. 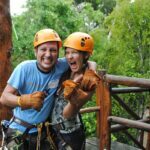 There is so much history here, and it is so close to the Riviera Maya hotels that we strongly recommend that you put one of these tours on your list of things to do while in Playa Del Carmen, or Cancun. If you like this tour you may also like our Chichen Itza tours from Playa Del Carmen!